Well, here I go getting behind again. Just when I think I've got it right life gets in the way and I'm back to square one. In the middle of January I was asked if I would give a talk in Sacrament meeting on the 9th of February. I agreed and decided I would have enough time (four weeks) to do the research, write the talk in English and translate it into French. It would be a great opportunity to develop my French skills. A couple of days later I was informed that the schedule had been changed and I would now be speaking on the 26th of January. Anyone who knows me knows that it takes forever for me to write a talk (just like a blog!). With less than two weeks to prepare, I spent every available minute of an already-busy schedule preparing. But I was still determined to do it in French. I'm not so foolish, however, as to think that I could do the translation myself in such a short time. I am far from bilingual! So instead of doing my own translating and asking Elder Thia, who is from France, to correct it for me, as I had originally planned, I simply asked him to do the entire translation. We began working together on the translation on Friday, the 18th. I hadn't actually organized my closing remarks by that time, but I wanted to begin studying the French or I would never know it well enough by the following Sunday. And I knew Elder Thia wouldn't have time to work on it again until Tuesday. In the meantime I could finalize the English version and work with the French he had translated. This was all done on the computer of course, so I printed the translated page and a half so I could carry it with me and study it every chance I got (which is how I learn most of my French). By Tuesday I was beginning to panic as I realized that learning five pages of French would be more difficult than I had thought if I wanted to be able to convey the spirit of my message and not just read the words. I was relieved when Elder Thia finally came over and spent another couple of hours with me to complete the translation. He planned to come back on Wednesday and work with me on pronunciation and expression. I still needed to do some rearranging of scriptures and quotes in the text, so I decided not to print anything until the next day when it would be completed. HUGE mistake! The next day our computer crashed! Elder Rhodes had no success in his efforts to correct the problem and finally, late Thursday afternoon, found a shop he felt reasonably comfortable trusting, (The language barrier posed somewhat of a problem.) You can imagine my stress level by then! With almost as much prayer as study, I managed to deliver my talk with only three minor pronunciation errors, according to Elder Thia, who was translating it into English for those who didn't understand French. Except for Elder Thia's help I would never have been able to give the talk in French. He put a great deal of effort into making the translation reflect the meaning and spirit of what I was trying to convey, and in helping me understand the phraseology and pronunciation. In the end, it was a very positive experience for me. It definitely increased my knowledge of French. More importantly, it strengthened my testimony of prayer and of Heavenly Father's love for and awareness of each one of His children. I know He is personally involved in our lives to the extent that we will allow Him to be and that He will help us accomplish our worthwhile goals if we ask Him, and if we put our best efforts into them. Well, the laptop worked for about a week and then crashed again. 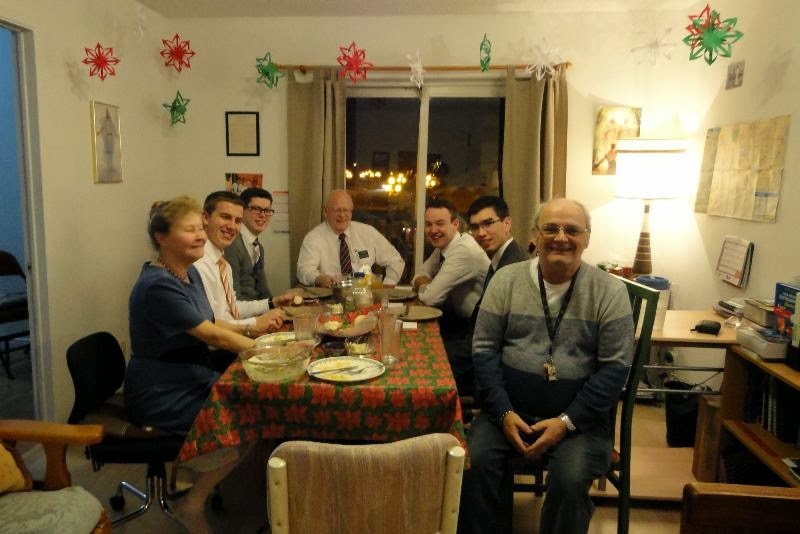 We had a zone conference in Ottawa the following week so Elder Rhodes decided to take it with us to a member of the stake who does something with computers for a living. We met him when he had been up here working on one of the Branch computers a couple of months ago. Brother Cameron determined that we needed a new hard drive and managed to get it working again by the time we left Ottawa. Elder Rhodes spent the next couple of weeks glued to the computer re-installing programs and cleaning out files. I couldn't get near it. The up-side of that is that I learned to use my tablet more effectively, as it was my only resource for the better part of a month. I tried to blog from the tablet but just messed up what I had previously drafted; so I gave up on that idea. I'm still electronically challenged. The zone conference was wonderful, as usual. The training we receive is always so encouraging and helpful. The Spirit is very strong when you meet with so many good people who's main purpose is to "help others come unto Christ". I marvel at the dedication and hard work these young people consistently display and at their sincere desire to learn and do what the Lord wants them to do. Working with so many dedicated young missionaries is a humbling experience. They are a great example to me. The missionary work has been going very well here lately. The elders in Rouyn tracted into a member last month who was not attending church because he didn't know there was one up here. He was excited to discover he could attend church again and has been faithful ever since. Another member who recently moved here from Edmonton is now attending also. A couple of less active members are rearranging their work schedules in order to be able to attend church again. One of the investigators the Elders in Val d'Or are teaching has set a baptism date for the 29th of March. Josette is a lovely woman who is completely dedicated. The branch will be blessed to have her. We don't have a font here so we will rent the swimming pool at the CEGEP (tech/collage/university) for 15 minutes. It's just two blocks from the chapel. It will be a unique experience. We are looking forward to the coming weekend. 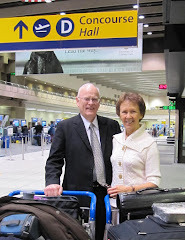 We will be at an all-mission conference in Montreal where we will receive training from Elder Neil L. Anderson of the Quorum of the Twelve Apostles, Elder Donald L. Hallstrom of the Presidency of the Seventy, and Bishop Gérald Caussé, First Counselor in the Presiding Bishopric. We are all very excited! The following pictures have been sitting here in draft since January. 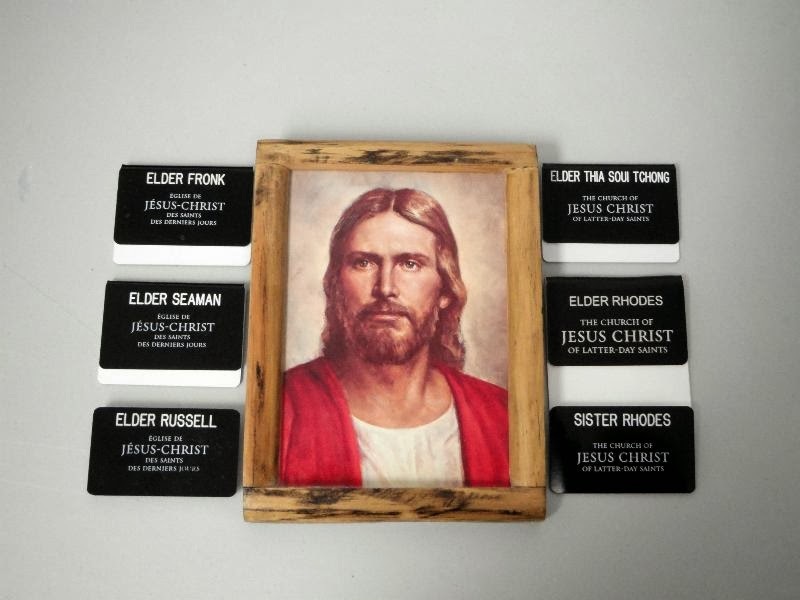 This was Elder Thia's idea. I love it! Making Christmas decorations for the branch Christmas dinner. Finishing the Christmas decorations in our apartment. The children love the Elders. Elder Seaman is such a good sport. The girls sang Jingle Bell Rock in the program. Notice the decorations the children made hanging from the ceiling and on the tree. We don't have a cultural hall so our chapel became our dining room. 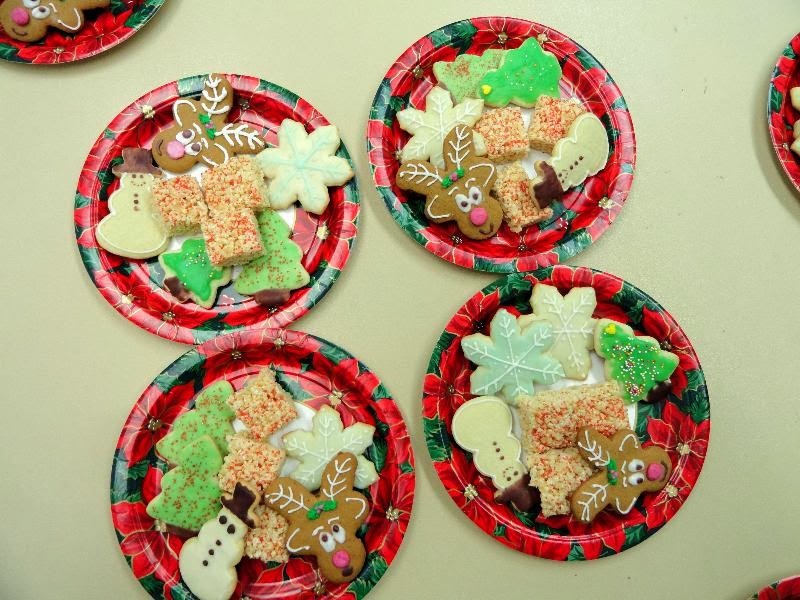 The children helped me make cookies to deliver to families to whom we went caroling. 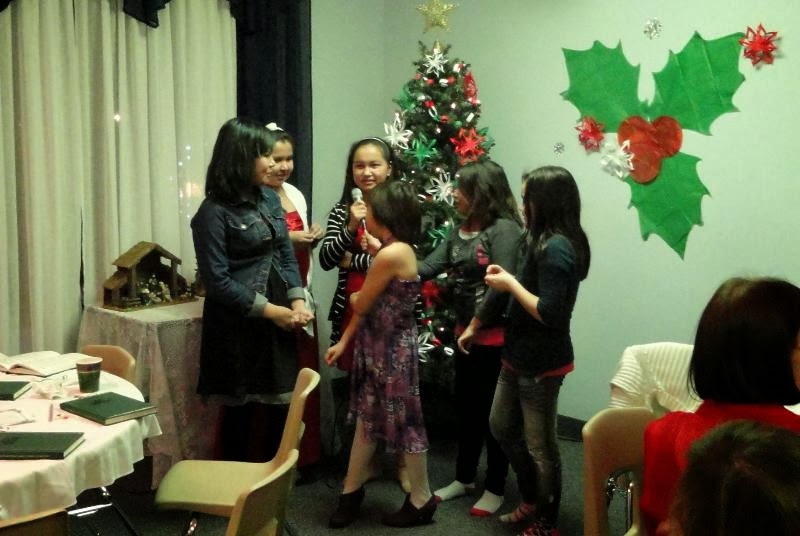 We had eight children at practices but only three made it out caroling. 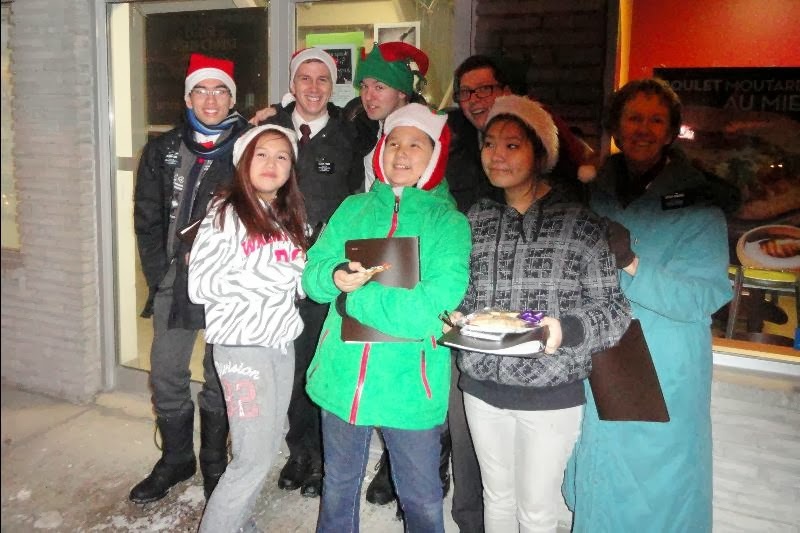 A perfect evening for caroling. The weather cooperated and warmed up to a balmy -20 with no wind chill. We had a great time. Elder Rhodes found this treasure at a garage sale last spring. I love it. Notice my new kitchen floor. I forgot to mention that our landlord changed it while we at Zone Conference last October. Setting up for Christmas dinner. Elder Seaman often helps with the cooking. 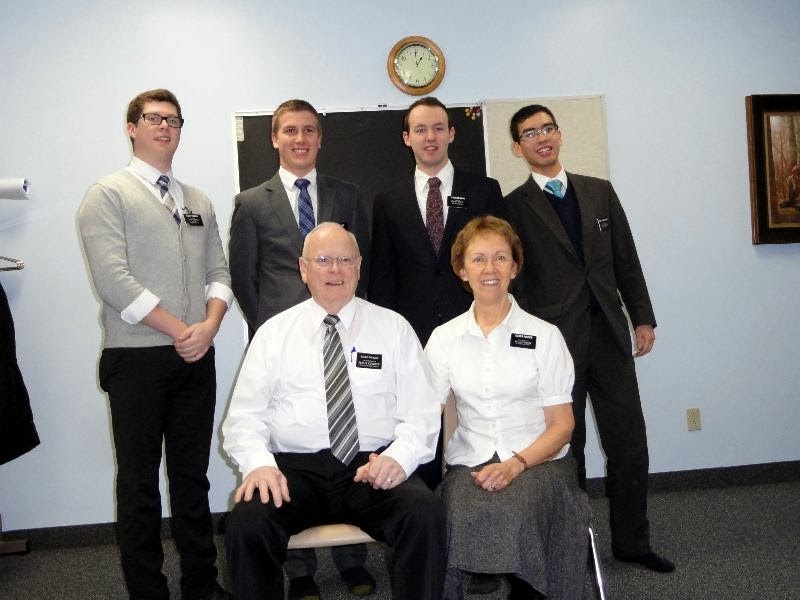 Nicole Lacert, and Levi with the Elders. It was nice to have a woman's company for a change. After the clean-up game we played pictionary. We had a ball! Karleen and Paul visited us for a few days just after Christmas. At -48 with the windchill it was so cold we couldn't do much outdoors. We had hoped to go dog sledding but thought better of it in that weather. But one day when the wind died down we decided to climb the Rotary Tower. We were surprised that it wasn't windy at the top; it usually is. Three of us were dressed in layers and managed to enjoy the view without feeling the cold too much. Karleen taking a panoramic photo. Karleen, Madame Gabreyze (our landlady) and her son, Henry. 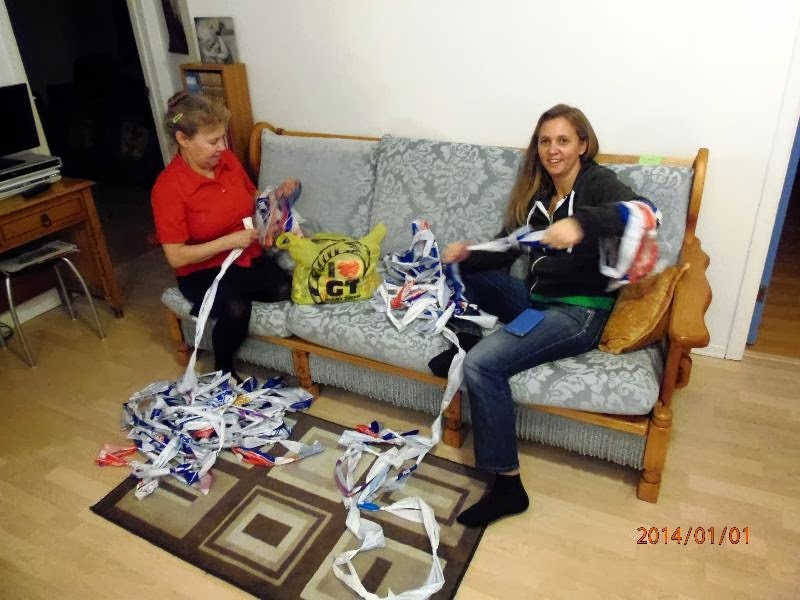 Karleen and Nicole making "plarn" from plastic milk bags to crochet into sleeping mats which are shipped to third world countries and disaster areas. Nicole has made over 130 mats herself in the past year. To learn more about the project go to Mats4Haiti. All good things must end. 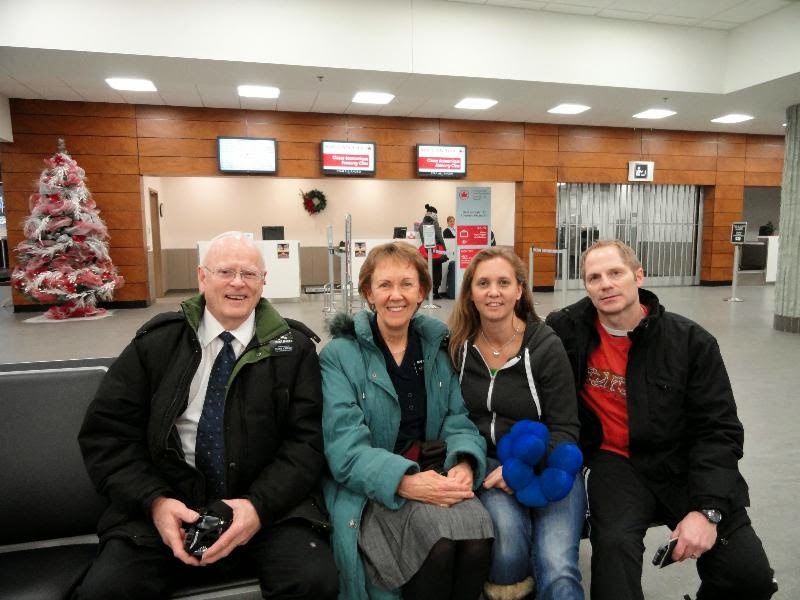 We were sad to say goodbye to Karleen and Paul. We really enjoyed their visit. 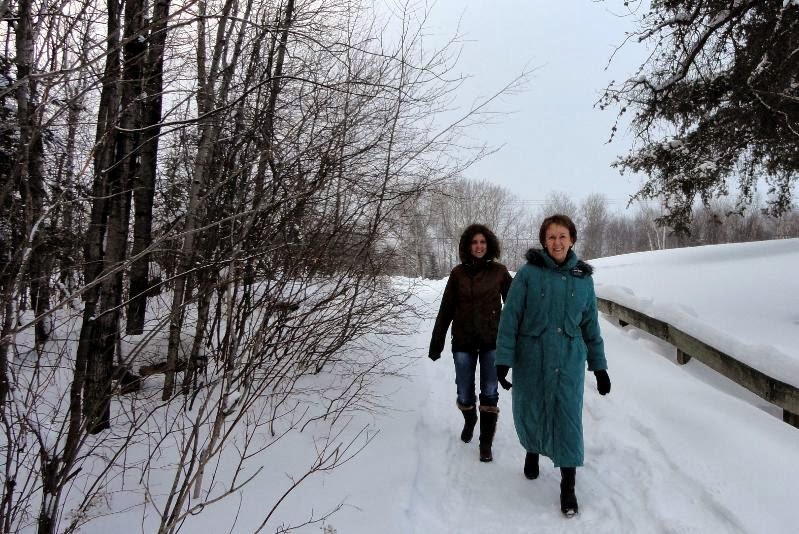 A typical winter scene in Val d'Or. The middle row of windows are ours. We both really enjoyed our visit with you and Dad and meeting everyone, even if it was colder than I have ever experienced before! 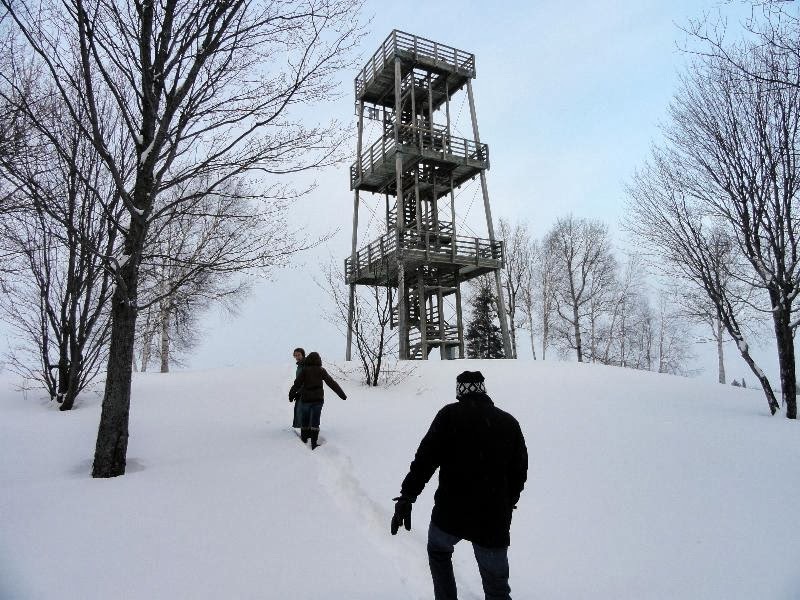 I'm glad we at least braved the cold to go to the top of that tower. The view of Val D'Or is beautiful. It doesn't surprise me that you were able to give your talk so well - you were doing great when we were there. You probably would have done great even if the computer hadn't crashed!